For organizations that have multiple campuses or sites, each with multiple facilities on them, you may decide to use Locations to describe the campus. Then you can use Bldg./Units to describe the structures on each campus. *Note: There are user roles in Work Order that can be restricted to the Location level, but not the Bldg./Unit level. Enter the Address, Number of Occupants, Square Footage, Date Built and any Notes for this location. This information is not required and can be added at any time. 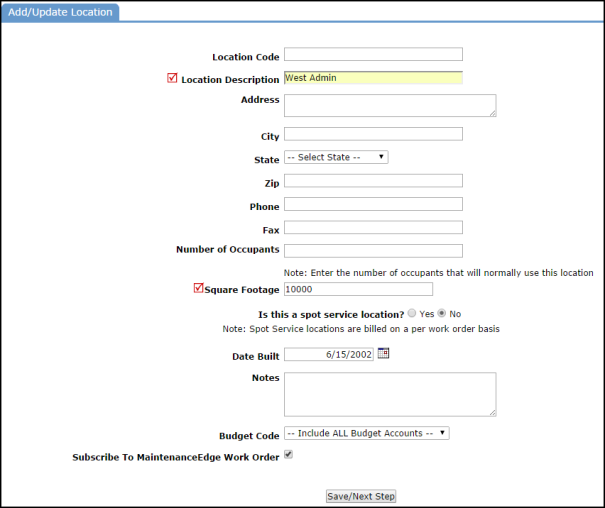 In order to use this location in Work Order, make sure the Subscribe To MaintenanceEdge Work Order box is checked. The Assign Users to New Location screen will load giving you the option to assign existing users to the location that you just created. Select the users you wish to assign to the location and then click Assign Selected Users to save.